A new project is on my needles. Rock Island Shawl by Brooklyn Tweed. I’ve admired it for a long time. My knitting skills are getting a real workout and I am not even beyond the 12 stitch edging. I found Madelinetosh Prairie Yarn in the Medieval colorway and decided to go for it. 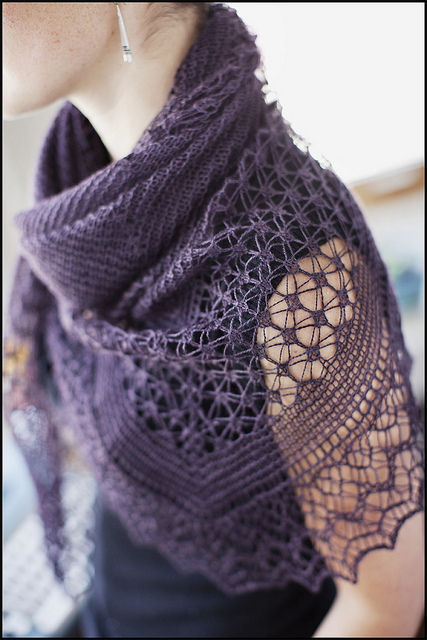 The shawl is a long-term project. Very long-term. I cast on about three days ago and I’ve managed to complete only 10 of the 71 repeats of the 8 row pattern. That means I have 488 more rows of edging to knit. One would think 12 stitches per row wouldn’t be difficult to whip off the needles. In fact, when I first looked at the edging chart I thought no problem. Lace making takes place on both sides just remember to reverse the decreases, yadda, yadda, yadda. I forgot the knitting gods don’t like hubris. They really, really, really don’t like it. To make my arrogance complete, I decided I wouldn’t work with a life line. I mean a life line for 12 stitches? I completely blew past the reality that this was complicated lace making. Thus, dear fellow knitters and crafters, I paid and paid well. How badly did I mess this up? Let’s count the ways. Knitting the first stitch of a RS row as if it were a WS row. Knitting the first stitch of a WS row as if it were a RS row. Mixing up the decreases. Using k2tog when it called for ssk. Mixing up the decreases. Using ssk when it called for k2tog. Talking while knitting a row. The result wasn’t even close to the pattern. Moving my attention from knitting to Yarn Rascal. A disaster all around. Suddenly putting down the knitting in the middle of a row for any crises imaginable, picking it back up hours later and knitting the wrong row ending. Thinking it was possible to tink back a row and get it right working in lace weight yarn. I could go on, but why torture myself? Suffice it to say, I am now working with a life line. It hasn’t stopped the ripping back, but it has contained it from going all the way back to the start every time I make a mistake. I no longer speak while knitting. I no longer respond to crises. Nothing interrupts me until I get to the end of a row and check that sucker off my little counting sheet. This is why I knit ladies and gentlemen: it’s so darn relaxing.